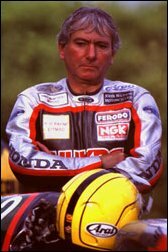 Joey Dunlop will be posthumonously awarded the prestigious Segrave Trophy give for outstanding speed exploits on land, water or in the air. It is named after Sir Henry Segrave who was the first man to break 200mph on land. He lost his life trying to be the first man to do 100mph on the water. Linda Dunlop will be presented with the award in September at the RAC headquarters. Joey has actually been nominated in the past for his achievements, however after his fantastic performances at last years TT and taking into account his age, the committee considered him to be the outstanding choice. Sir Donald Campbell and Bruce McLaren have also been awarded the trophy posthumonously in the past.